Type 2 diabetes forced doctors to amputate Patricia Lewis's legs. Thursday she thanked her colleagues and prepared to leave a Lynbrook rehab facility. Patricia Lewis stepped gingerly on two artificial limbs into her next chapter of life Thursday as she praised the two Long Island medical institutions that aided her recovery from a life-threatening health crisis. The staff at Lynbrook Restorative Therapy and Nursing marveled at Lewis, a registered nurse who for months has been their patient. Colleagues from Mercy Medical Center in Rockville Centre dabbed away at tears as they watched Lewis walk again. 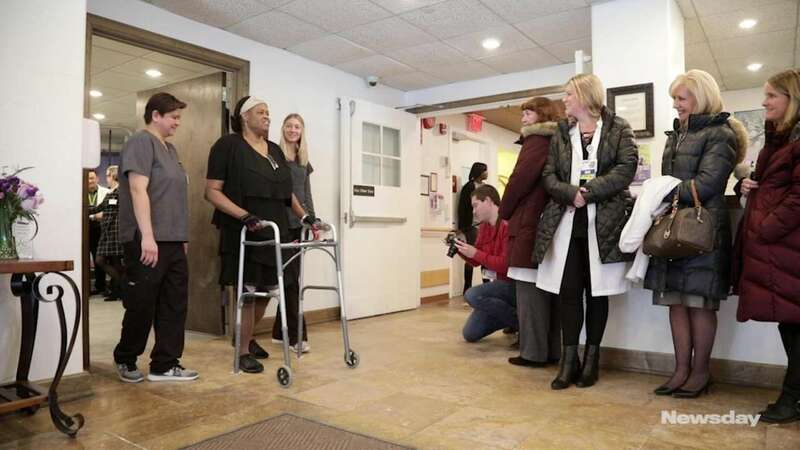 “She is the most inspirational woman I’ve ever met,” said Maggie Glier, Mercy’s director of nursing services, during a news conference at the rehabilitation center in Lynbrook where Lewis relearned to navigate the world without her natural legs. She begins life at home on Friday as a double amputee. Lewis worked 12-hour shifts as an oncology nurse at Mercy until a constellation of medical problems cast the Rockville Centre resident into a health care odyssey that consumed her life for months, culminating with the loss of both legs below the knees. Symptoms of Type 2 diabetes had escaped her notice as she concentrated daily, instead, on the needs of her patients. The condition can damage blood vessels throughout the body, especially the extremities. “Pay attention to your body and make sure you observe symptoms,” advised Lewis, who acknowledged Thursday she knew of the metabolic disorder’s symptoms but did not recognize them in herself. Instead, Lewis said, she had blamed her discomfort on long hours at work. Lewis wrote off the extreme thirst and frequent urination — key symptoms of diabetes — to demands placed on her body by June's intense heat. Both symptoms of type 2 diabetes had emerged quietly but suddenly, she said. Having failed to heed the signs, Lewis spiraled into unconsciousness as the result of the stroke and wound up in Mercy's intensive care unit. Doctors amputated her legs in separate surgeries more than a month apart despite efforts to save them. The first amputation was in September, followed by another in October. Yet, Lewis isn't alone as a health care provider who needed medical care from her own colleagues. Nurses and doctors frequently wind up as patients, and sometimes at the medical institutions where they work. Earlier this week, it was revealed that Dr. Robert Montgomery, director of NYU Langone’s Transplant Institute in Manhattan, underwent a heart transplant. A report in The Wall Street Journal noted the operation was performed at NYU by Montgomery's colleagues. The surgeon had been diagnosed with familial cardiomyopathy, a degenerative heart disease that had claimed the lives of his father and brother. As for Lewis, her colleagues couldn’t stop praising the perseverance she displayed in the face of a stroke, two surgeries and months of rehabilitation. "In the field of medicine we consider amputations catastrophic," said Dr. Paulinder Rai, medical director of the amputee program at Lynbrook Restorative Care and Therapy and a wound care physician at Mercy Medical Center. "Patricia's story is unique and a testimony to her fortitude," Rai said. Lewis explained that, while in rehabilitation, she relearned to climb stairs and perform personal care activities, including how to access a bathroom in a wheelchair. Lewis, however, was willing but not yet able to dance on her new legs. As the rehab center's staff pumped up the volume on the rhythm and blues standard, "Ain't No Stoppin' Us Now," she attempted a few dance steps, aided by a walker. "It's a new beginning," she said.